World AIDS Day: Fighting AIDS Out Loud. Today is World AIDS Day. A day when the globe comes together to fight the deadliest silent war this earth has ever experienced. But it’s not so silent anymore. 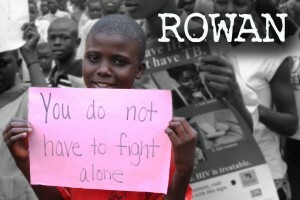 Twelve years ago when I went on my first visit to Uganda, AIDS was taboo- no one talked about it. People were dying of malaria, typhoid, nutrition- but never HIV/AIDS. Thousands passed away with not even knowing the cause. Today, this war is not so silent. Men and women flood our local village office with their HIV+ card dreaming to join our ministry and fight this battle with hope. As we conduct numerous HIV training courses and educational seminars, individuals are realizing they don’t need HIV to define them. They have worth. They have a voice. And the fact is, their life is not over. The future is bright. It is not about being HIV+, but living positively. If I could title this day, it would be “Fighting AIDS Out Loud.” Will you fight AIDS out loud with us? There’s no greater way to help than to sponsor one of these amazing survivors…one life at a time.